to score the first run of the game. Titans entered last week under .500 and enter this week still under .500. Conference play is coming up quickly. Here are our takeaways from the past week in Titan Baseball. With a drag bunt to lead off the bottom of the first on Sunday, Hank LoForte now has reached base safely in 62 consecutive games. 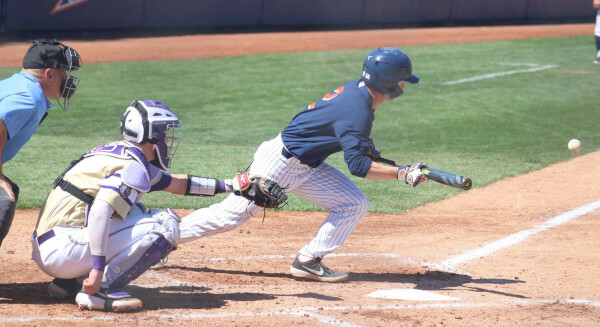 LoForte went 2-for-5 with two RBI and scored two runs on Sunday. For the curious, Hank’s streak started on March 11, 2018 at Oregon State last season. We will take a deeper dive on this streak if Hank is able to get closer to the 101 number. Just know that it is not impossible but will require the Titans to play in three games in the 2019 postseason. Titan fans have not seen Jackson Lyon for a few weeks and now even more Titans will be regulars in the training room. Junior catcher, Daniel Cope will miss roughly four weeks with a broken finger. He fractured his right index finger while attempting to bunt Saturday night vs. James Madison University. 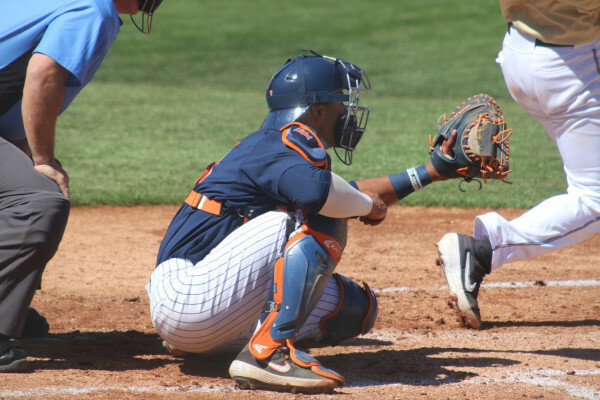 This will give freshman Kameron Guangorena more time behind the plate to go along with his batting role he was already receiving as a Designated Hitter. Korrey Siracusa could see time behind the plate while Cope is on the mend in order to give Guango a break. Siracusa has not played in a game this season and looked to be on pace to redshirt this season. With just two healthy catchers on the roster for the next month, Siracusa could be forced into duty to give Guangorena a breather. Jackson Lyon’s return could be the biggest mystery this side of who started the Chicago Fire. Lyon is out with a back injury and there is no timetable for his return. Titan fans when hearing back injury with an uncertain timetable will immediately think of former Titans Scott Hurst and Ruben Cardenas. Both Cardenas and Hurst missed significant time with back injuries during their time on campus. The good news hopefully for Lyon is both those guys came back from the injury and eventually were drafted. 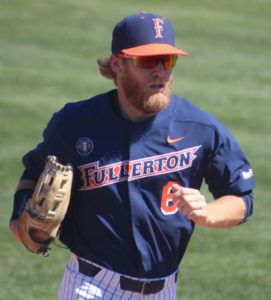 Both Hurst and Cardenas are currently playing professional baseball. Trevor Cadd, freshman from Riverside, is expected to redshirt with a shoulder injury. Cadd has yet to play in a game in 2019 and his shoulder does not look to be healing in time to come back and play a contributor’s role. AJ Curtis‘ role has been that of DH due to his hand injury he had coming into the season. Curtis can hit but fielding will be an issue. Unfortunately Curtis’ .167 batting average is not up to par, thus opening the door for others like Jairus Richards to take over the DH spot now that Guango is catching. 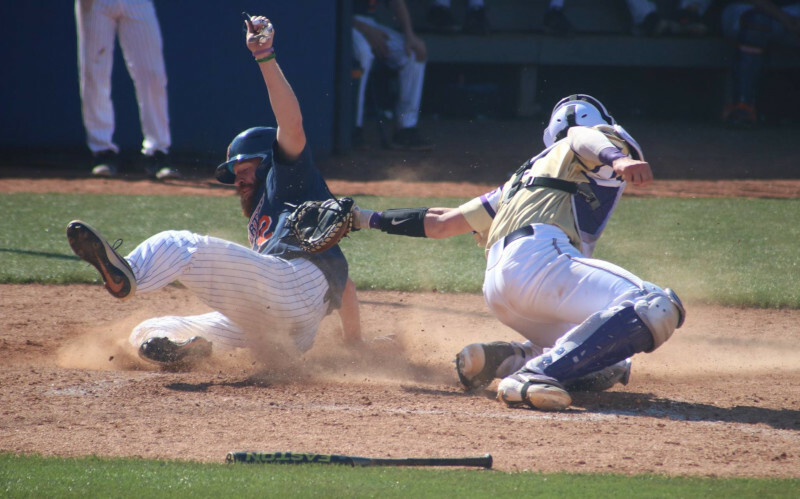 Senior Jairus Richards slides safely under the tag of James Madison University’s Kyle Hayes. Jairus Richards seems to have taken to the pinch hitting role quite nicely. 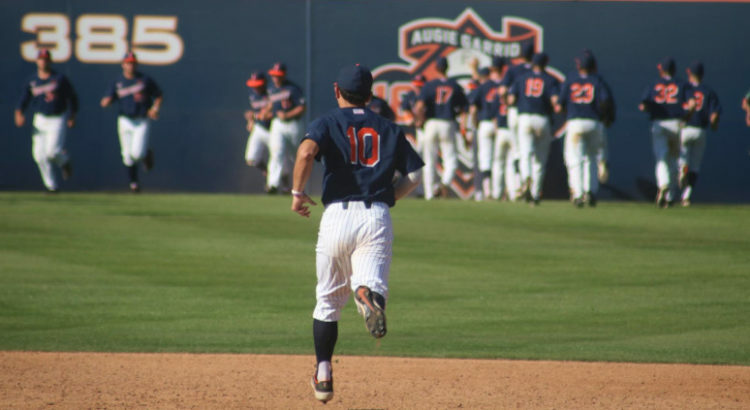 The pinch hit walk-off vs. Stanford was one for the ages. Dating back to that game, Richards is batting .364 with 4 RBI, 3 walks and only one strikeout. He has also scored 5 runs in that stretch. Although those numbers may warrant more playing time, Hook may keep him as a clutch pinch hitter off the bench because his one start as DH, he went 0-for-3. Then again, now that Kameron Guangorena is behind the plate for the next month, that frees up the DH spot for Richards to contribute. Mitchell Berryhill is starting his senior season off nicely batting over .400 to start the first 1/3 of the season. Overshadowed by LoForte’s amazing on-base streak, Mitchell Berryhill is putting together a rather nice senior season. He currently leads the team with a .421 batting average and stolen bases with three. Sticking with the pattern that Hook has developed over the past few years, Berryhill has been moved to the bottom of the line-up. Normally the eighth and ninth hitters are the weakest of the line-up but in Hook’s line-up, the better hitters tend to end the card. This way once the line-up reshuffles with runners on base, the eighth and ninth hitters will usually start off an inning. With Berryhill’s speed and ability to bunt for an infield single, this looks to be a shrewd move. Since Berryhill was not drafted last year after his junior year, if he keeps hitting like he has to open the season, he could be a nice senior draftee for a Major League club. Small ball back in fashion? The previously mentioned Hank LoForte drag bunt single to open the bottom of the first was classic Titan Baseball. Once on first, Hank advanced to second on a wild pitch and then stole third. After a foul out by Zach Lew, Sahid Valenzuela hit a sacrifice fly to left to score LoForte. 1-0 Titans headed to the top of the second. In the second, Brett Borgogno got on with a bunt single and later scored on a Mitchell Berryhill RBI bunt single. 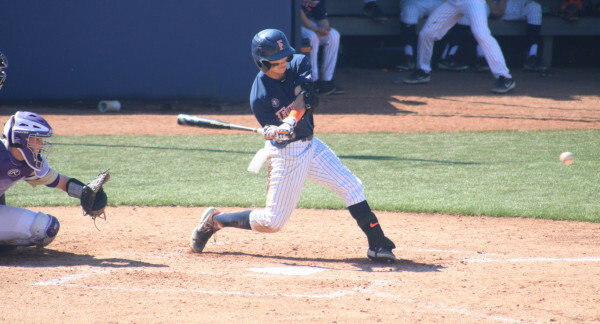 Double steals, getting hit by pitches and gaining walks were other ways the Titans generated offense on Sunday. Although it is a small sample size, maybe the Titans and coaching staff are not as enamored by the long ball anymore and have gotten back to small ball and manufacturing runs. Scratch out one run per inning and you are looking at eight to nine runs a game. Any pitcher at any level will be happy with a team that scores eight to nine runs a game. Isiah Garcia is swinging a hot bat. Could it be the superstition of pulling out his back pocket? Baseball is a game of superstitions. Pitchers not stepping on the lines is a big one. Thomas Eshelman was a big believer in not stepping on lines. Connor Seabold would literally leap like a gazelle over a foul line before returning to the dugout after a 1-2-3 inning. Titan fans sitting on the third base side have noticed that Isiah Garcia comes up to bat with his right back pocket out of his baseball pants. Not sure if this is intentional or if he keeps his batting gloves in that pocket and it comes out when he pulls them out. Either way, having his back pocket pulled out seems to be working. Garcia is batting .417 on the year. 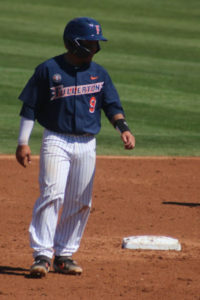 On Saturday against JMU, when Garcia went hitless, during his final at-bat fans saw him with both pockets pulled out. An obvious move to double down on the luck and get a hit. Garcia had three official at-bats on Saturday and he ended the night with a strike-out. Guessing the double pulled out pocket was not the juju the baseball Gods were looking for. Although some may think it looks sloppy to have your back pocket of your uniform hanging out, if it helps Garcia hit above .400, we’re confident Titan fans are willing to look the other way… more than likely opposite field. Titans travel south to play University of San Diego this evening. This will be the second time this season they have played at Fowler Park, playing Oklahoma in the Tony Gwynn Legacy tournament in week two. Tonight marks the first meeting this year playing USD. Look for a San Diego flavor tonight with Joe Magrisi a favorite to start. Coach Vanderhook has a propensity to play guys on the road if visiting their hometown. Zach Weller, another San Diego native may get more playing time than normal in front of the hometown crowd. Jeff Pellegrino, a JC Transfer from San Diego Mesa College, could see some time if not get a start. The injury to Daniel Cope will prevent another San Diego guy from playing in front of the hometown folks. Michael Knorr, the Carlsbad native from north San Diego County is not expected to play due to the fact he started the Sunday game vs. JMU going seven strong innings and not giving up an earned run. Titans stay on the road, traveling this weekend for the non-conference series against Long Beach State. Despite the Dirtbags struggles this year, expect their best effort against the Titans. This rivalry is always intense and we’re confident they are circling this series as a way to get their season back on track. All three games at Blair Field and you can expect numerous Titan fans to the make the trip to Long Beach.